Prime Minister Hun Sen, center, leans over a garment worker during a visit to a factory outside of Phnom Penh, Cambodia, Aug. 30, 2017. The European parliament has voted to consider suspending Cambodia's preferential "Everything But Arms" trade access to the European Union in response to the country's authoritarian backslide. Such a move could have dramatic consequences for the country, which sells about half of its exports to the EU, mostly in the form of garments and footwear - industries that employ more than half a million Cambodians. In a motion passed Thursday condemning the dissolution of the country’s opposition party, EU parliamentarians called on trade commissioner Cecilia Malmström to “immediately review” Cambodia’s duty free and quota free access to the single market through the Everything But Arms scheme. “...if Cambodia is acting in violation of its obligation under the EBA regulation, the tariff preferences it currently enjoys must be temporarily withdrawn,” the motion stated. It also called on the union’s external action service to prepare a list of individuals responsible for the dissolution and other human rights violations for potential visa restrictions and asset freezes. EU lawmaker Charles Tannock told the parliament that the dissolution of the Cambodia National Rescue Party and jailing of its leader, Kem Sokha, was a “damaging blow” to democracy and “the text book move of a typical tyrant”. “The people of Cambodia, after the genocidal Khmer Rouge regime last century deserve democracy; they deserve better,” he said. The U.S. and EU have both already pulled funding for Cambodia’s elections next year, while Washington has also placed dozens of government officials on a restricted visa list in response to the Cambodian government’s ongoing crackdown on the opposition, civil society and the media. Sweden has suspended any new government-to-government aid to Cambodia except for education or research. Wednesday during an unannounced visit to Phnom Penh the U.S. deputy assistant secretary of state in charge of Southeast Asia, Patrick Murphy, told reporters Washington was considering taking further measures against Cambodia. Cambodia's Prime Minister Hun Sen, right, prepares to deliver a speech during a factory visit outside of Phnom Penh, Cambodia, Aug. 30, 2017. At a congressional hearing to discuss sanctions Tuesday U.S. lawmaker Brad Sherman (D-Cal), said Washington, the U.S. and Japan needed to take coordinated action against Hun Sen’s regime. “If we decide to forego the special access to U.S. market that any company buying garments from Cambodia can immediately void this contract, and so we can put that in the matter of law,” he said. Garment Manufacturers Association in Cambodia secretary-general Ken Loo could not be reached. But in recent statement, GMAC instructed foreign governments, the U.N. and buyers that the current political situation in Cambodia “shall not be translated into into any actions bearing negative impacts on the daily production and supply chain of the industry”. “We would like to maintain smooth operation of our 600 member factories that economically support more than 700,000 workers and about 2 million more people as their family members,” the statement said. Prime Minister Hun Sen’s government has brushed off threats of sanctions from western governments as irrelevant thanks to the growing economic might and generosity of China. In a speech on Friday he reiterated those sentiments, daring the EU and U.S. to freeze the assets of his party’s officials while declaring he himself held no money outside of Cambodia. [You] don't need to threaten. Let's do it. If you are good at that, please, you do it. Let's [see] you do it,” he said. Referring to an article in The Phnom Penh Post, the premier suggested a lack of concrete actions resulting from five previous EU resolutions showed such motions had little impact. “On the other hand, the EU needs to have consensus,” he said, referring the requirement for unanimous agreement from all 28 member countries for the EU to pass decisions related to foreign affairs. EU trade commissioner Cecilia Malmström did not reply to VOA inquiries. EU ambassador to Cambodia George Edgar said in an emailed response that the European External Action Service and the European Commission would seriously consider the recommendations made in the resolution but declined to comment further. The premier also seemed to suggest that foreign businesses would ignore the laws of their own governments if trade sanctions were imposed on Cambodia. “Not everyone just follows what you want to do - your sanction measures; your requests,” he said. FILE - Cambodian garment workers work inside a factory in Phnom Penh. The U.S. and EU absorb the vast majority of Cambodia’s exports - billions of dollars worth - while China enjoys an overwhelming trade surplus with the tiny kingdom. Chinese investment in Cambodia was close to $1 billion last year - vastly eclipsing all other nations - while Beijing also provides hundreds of millions of dollars in aid and multi-billion dollar infrastructure loans. More than 60 percent of Cambodia’s garment factories are Chinese owned. An op-ed in the Chinese state controlled outlet Global Times this week lashed western nations for “pretending to talk democracy” when their real motivation was to protect the billions of dollars they had invested in implementing that political system in Cambodia. Hun Sen’s protracted crackdown on his opponents has been buttressed by the accusation they have all conspired with the U.S. government to overthrow him in a color revolution. 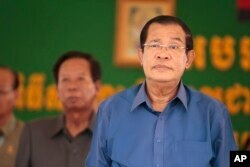 The premier has provided no credible evidence to support this conspiracy theory and observers say his regime has crushed opposition ahead of next year’s election because it was spooked by strong CNRP results in two prior ballots. Hul Reaksmey contributed to this report.